Many grants were awared this school year. 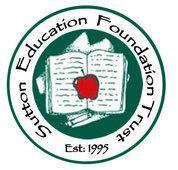 The SEFT funded: 20 Nook eReaders with 200 book titles ; 8 laptops and material to build model aquaducts for joint Middle School history/english project ; Therapy Ball seating and standing desks for Elementary school; Project materials for Sutton High Envirothon Team and Exploravision; Project funding for Hydroponic Gardens for the High School. Most importantly, a series of speakers were sponsored by SEFT titled "Understanding your Teen".